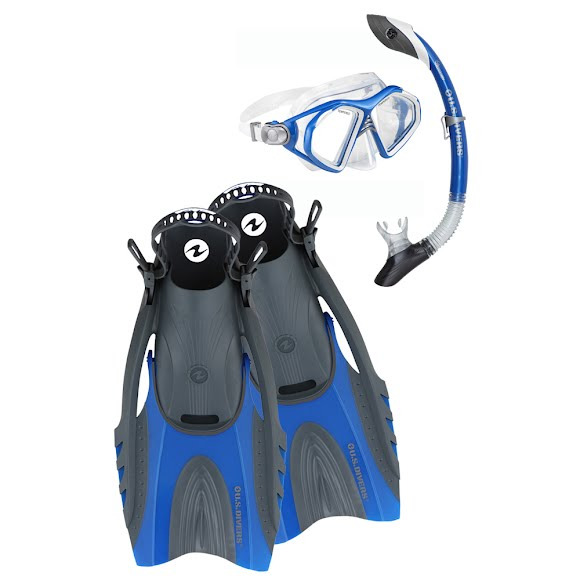 The Admiral LX Mask + Island Dry LX Snorkel + Hingeflex Fins + Travel Bag Set from US Divers is everything you need to get started exploring the wonders below the surface. Features include Pro-Glide buckles for easy adjustments and Pivot Flex Technology all in an efficient compact size that is great for travel. Dry Top snorkels are designed to keep all water out of the breathing tube whether above or below the surface of the water. These dry tops act as splash guards while on the surface of the water, and close automatically when submerged to seal out any water. Dry Top technology also provides excellent unobstructed airflow and easy purge (clearing) capabilities.